I have a copy machine lcd screen witch is connected to a board. i Would like to connect the screen to my pc i think it would be awesome. The screen is 120mm x 92mm witch is connected to the board via ribbon cable the board has a 30 pin connector, looks a bit like a floppily drive connector but a bit shorter. i Would like to know how i can connect it to my pc and how can i control it through my pc? 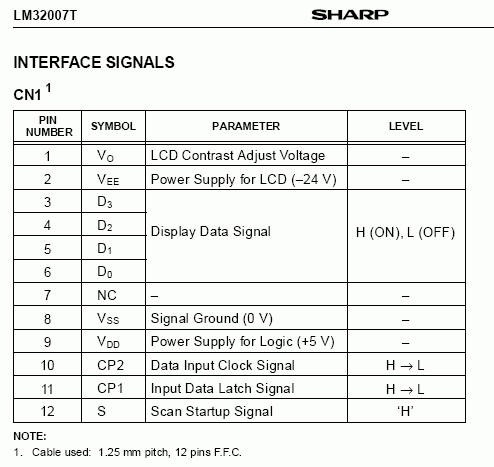 the large square QFP chip is a TMP87C841U microcontroller. So it has a custom program in it that we don't know what it does. And the 30 pin connector and it's communication protocol isn't documented anywhere. And on top of that looks like the board has got quite rough handling so it probably would need fixing before it works. S1D13305 controller is also supported in the PC softwares that you would probably like to use. You could try measuring with a multimeter where the pins from the 12 pin connector on your board go and compare to the above pinout. First I'd check the power pins like VDD and GND and if those match then continue trying to figure out the rest. If the power pins match I think there's a pretty good chance the rest is in the same order too. very nice i like where this is going. the 12 pin ribbon cable is right but there is another 4 pin along with that one, what do u think about the four pin one? I'm not shore if this lcd is color or not, is there anyway of finding out before hooking it up? The 4 pin connector is for a touch screen. But I don't have any touch solution to point you to at the moment. There are some separate touch screen controller boards but I'm not sure how you would take advantage of them at this time unless you plan to write your own software. This is most likely a monochrome lcd. Ok, I'm 99% sure of that. I don't need the touch screen feature all that much i was just going to use it to get stats like temp, time, date and scrolling text. ok thanks for all your help i will try to get this lcd connected asap and will post back when i do. edit: ps i have two of these screens but one is covered in mud and i don't think it will work. 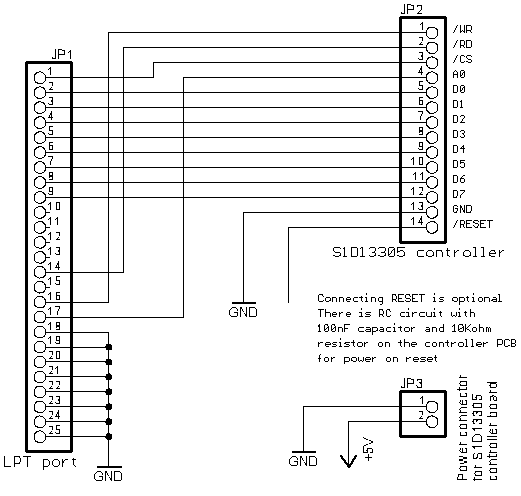 Hey i was wondering how i would go about hooking the lcd controller board to my pc, printer port? most of these screens i have read about are connected through the printer port. Even if you don't use the touchscreen you might think of it as a plus, as if you want, you could remove the touchscreen glass and under it you should find an untouched lcd glass without any scratches or other marks that can be often seen in used displays. Yes this controller would be connected to printer port. That is the way the common software supports connecting these controllers. Not very complicated wiring as all the "difficult" stuff is handled on the controller board. great diagram thanks for the help, what sort of software would i be using to control it any you would suggest? There are some others too but these were the first I thougth of. Epson Stylus Photo 935 is a printer I see. I highly doubt you would find a controller like S1D13305 or similar in a product like this. Most likely it has something highly integrated custom circuitry inside without any documentation available. ok thank you just have to wait till i make some money to buy the lcd controller, thanks for your help i will post back when i get it hooked up or need help, thanks heaps! Hello, and thank you for creating this wonderful forum. I happen to own a Sharp LM32015t, which is compatible with the pinout of the sharp lm32007 discussed in this topic.I managed to get the voltage pump working, and assembled a led backlight instead of the ccfl one.my problem is that i do not know how to match the following pins: CP1, CP2, S with the control pins from the lpt side: /WR, /RD, /CS, A0. I appreciate any support in solving my problem, as i do not have the money to buy a controller board at this time.